People depend upon the region's natural bounty for their livelihood, for beauty, and for recreation. 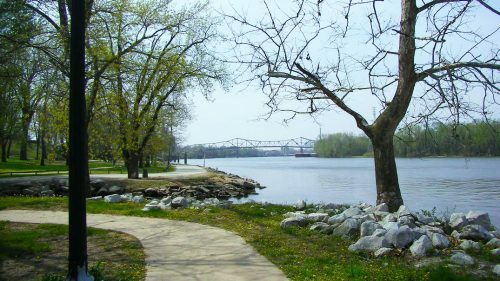 Many seek out the region's outstanding recreational opportunities, from biking and hiking on rail trails to camping and picnicking at the valley's many state sites. Along the Scenic Byway, one can immerse themselves in the outdoors-watching wildlife, fishing, hunting, horseback riding, and boating-or discover the region's cultural history at area museums, historic sites, and visitor centers. The valley's natural areas also offer important opportunities for relaxation, solitude, and quiet contemplation. Recreation and tourism have emerged as important contributors to the regional economy. As they have for more than 12 thousand years, people continue to earn their livelihoods from the natural wealth of the Illinois River Valley. Enormous fields of corn and soybeans blanket the landscape. Family farms grow grapes, trees, native plants, herbs and ornamental plants. In summer and autumn, roadside stands offer fresh produce to travelers. Visit the Illinois River Road sites below to experience how the Illinois River Valley offers extensive opportunities for recreation and renewal, and how the rich natural resources of the Illinois River Valley provide a livelihood for many residents. Offering Illinois and locally made and produced products.